Our current thoughts about getting insulated garage doors sound very simplistic when we consider the potential of future homes and read the latest studies about the new ideas to transform the single family houses in California into eco-friendly properties with the use of natural materials. Many houses are already constructed entirely out of wood or stone, but the most futuristic material is glass. People of today turn their roofs into small gardens or enjoy solar roofs. People that have already moved to the future talk about solar panels for our garage doors that will absorb the energy of the sun and even feed their hybrid car while the most utopians speak of all glass houses that will invite the sunlight in and gather the energy the house needs. The glass will go through various elaborations that will elevate its insulation properties to a great extent and houses in La Jolla will not have to use the central heating system even on the cold winter days. Why not install glass garage doors all over? The house of the future and of your dreams could have glass panel in each room and each wall. This way, you could enjoy the advantages of an ecological home and the advantages of glass doors all in one. When glass will become the prime building material of the future instead of cement, remember that your house will be ventilated better through glass doors that will be found all over the house including the garage. The consequences are definitely positive. 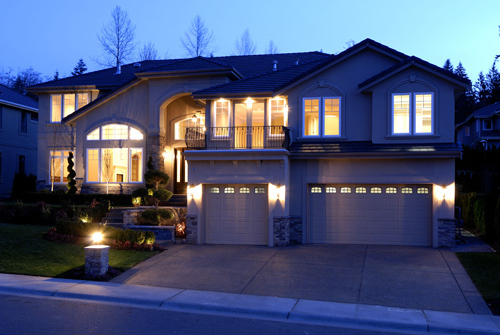 Of course, you will have to devote more hours for maintenance not only because of the existence of multiple doors, but also because of the need to feel safe with the presence of so many garage doors. Though, you will feel one with nature and will surely have the choice of installing milk glass to keep your privacy and safety glass to ensure your protection. It might be an expensive solution, but think of all the money you will be saving by not paying for electricity!